Hillary Clinton is a busy lady these days out on the campaign trail, but that doesn’t mean she hasn’t seen the latest Saturday Night Live episode, featuring her look-alike, Kate McKinnon. In fact, the presidential candidate has some thoughts on her performance. 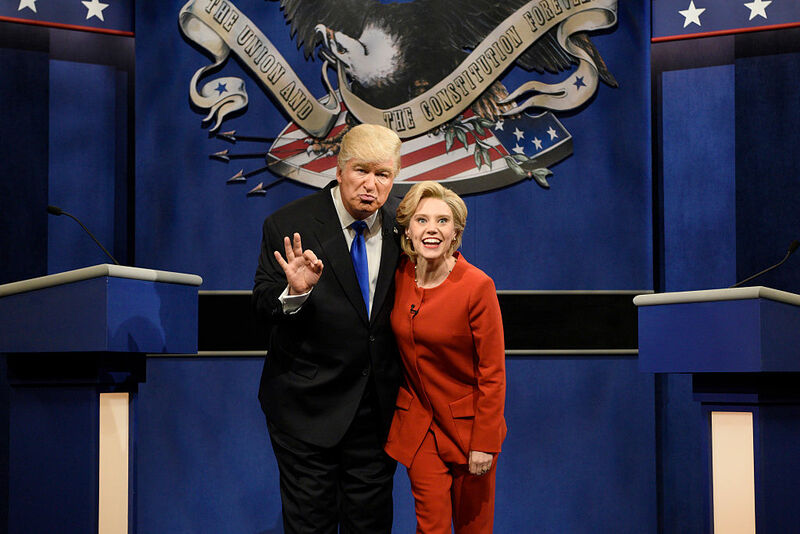 On October 1, Saturday Night Live returned for its 42nd season and one its most memorable skits of the night was the “Presidential Debate.” The skit featured McKinnon reprising her role as Hillary Clinton and Alec Baldwin playing Donald Trump. So what did the 68-year-old politician think of the funny skit? In short, she totally approved. "I saw it on delay, but I did see it. I'll tell you when Kate McKinnon came out with the walker, I thought I was going to fall off my chair. She makes me laugh anyway, she is so funny just naturally," Clinton told Extra's AJ Calloway in an interview on Tuesday. "Oh, my gosh, she was amazing. I wish I could do the jumps, the splits, the somersault. I’ve been working on it." Clinton has always been a good sport when it comes to being spoofed on SNL, but what did she think of Baldwin’s portrayal of her Republican opponent? "Perfect. I can’t wait to see what else they're going to do. His look, his scowling, his staring down then muttering his response, he was perfect. I don’t know who is going to show up at the next debate Sunday night," she joked. The Chicago native also revealed that although she doesn’t have time right now — you know she’s running for President and all that — she wouldn’t mind appearing on the comedy series again soon. "We have a lot of ground to cover in the next 35 days, but I’m always up for standing around the bar," she said, talking about her last appearance as barkeep Val on the show, when she acted alongside her TV twin, McKinnon.